Today I remember Kenneth Grant a great adept and master. His influence on my own spiritual work is undeniable. His deep insight and creativity will live on through his voluminous work and legacy. The 93 Current evolved and matured in new dimensions because of your dedication and inspiration. Thank you, Frater Aossic. See you Outside the Circles of Time. This small stone with the eery greenish lustre is moldavite, thought to originate from a meteor impact about 15 million years ago in the region of central Bohemia. Now I must admit to being ignorant of the meaning of some these attributes (what are “star children” for example?). Still, I was intrigued and enjoying the peaceful and mystical atmosphere of Sedona, so I took the stone into my left palm (as the left hand is generally passive and absorbing of energy inward, in contrast to the right hand which projects dynamic energy outward). 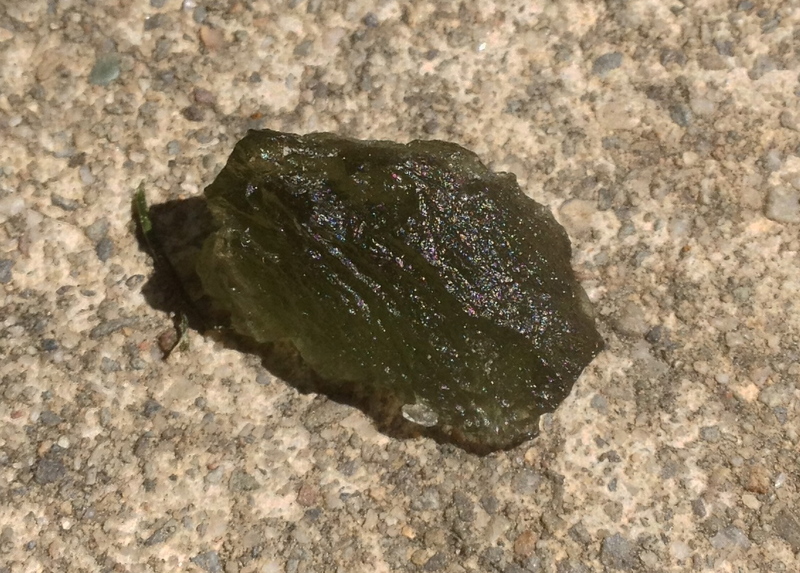 I felt an immediate affinity for the moldavite, as consciousness opened up and expanded seemingly into space. The sensation of coolness was unmistakable, and an open expanse of space and stars. I spent a good minute in the Vortex Crystal shop just “spacing out” while I held the small green piece of rock, much to the pleasure of the shop keeper! The moldavite now rests on my shrine. I hold it in the palm of my left hand when performing mantra japa, and find that it helps to affirm a sense of openness and expansive consciousness. What better way to fly with the sky dancers in their own natural habitat then to lift off with them into space!